Are you missing a tooth or several teeth? 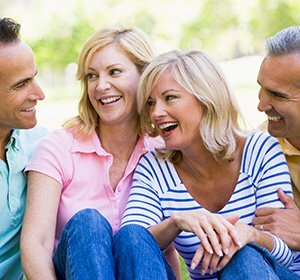 Are you embarrassed to go out in public in Lansdale or are concerned about the gaps in your smile? Are you noticing that some of your other teeth are getting undue wear to compensate for your missing teeth? If you are ready to get a full, complete, healthy smile, Black and Bass Cosmetic and Family Dentistry outside of Montgomeryville can help you with this! 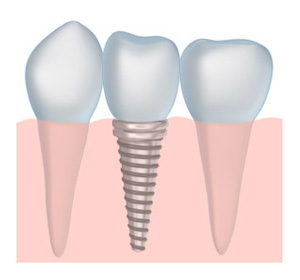 Our recommendation is dental implants. Implant dentistry North Penn doctors, Dr. Lawrence Black and Dr. Kevin Bass, are experienced in restoring dental implants with dental crowns. Implant dentistry is a two-part process. First, an oral surgeon or a periodontist places the tooth implant into your jawbone. After this placement, a temporary crown is placed at our Lansdale office while the tooth implant heals, usually 3-6 months. The tooth implant then fuses with the jawbone, creating a “new” tooth root. Second, our dental team near Montgomeryville and North Penn, place dental crowns on the dental implants. This is the restorative part of implant dentistry. With a dental crown on a tooth implant, this implant dentistry treatment gives you a “new” tooth and tooth root. Dental implants replace missing teeth so your smile is complete again. This means you are chewing on all your teeth properly, which can help ensure that none of your teeth will have undue wear. Dental implants can be used if you have several missing teeth. For instance, if you have more than two teeth missing in a row, you can have a tooth implant placed on each side of the gap and have dental bridges secured between each tooth implant. If you have more teeth missing, a denture or partial denture can be secured to the two dental implants. These are much more secure than other more traditional options. Dental implants look, feel and function just like your natural teeth, and they can stay in place for the rest of your life. If you are ready to get a full, complete smile you can show off with confidence, call us today in Lansdale! Our dental team is here to make your dreams come true if you are in the North Penn area, including Montgomeryville!